Everyone loves receiving handmade cards. Now you can give them without the fuss of making them, and benefit a great cause at the same time. With Ready. Set. Send. cards we’ve already done the work of making the cards for you, and for every kit sold, Stampin’ Up! is donating $10 to the National Breast Cancer Foundation! Just grab a card, write a quick note, and off it goes. 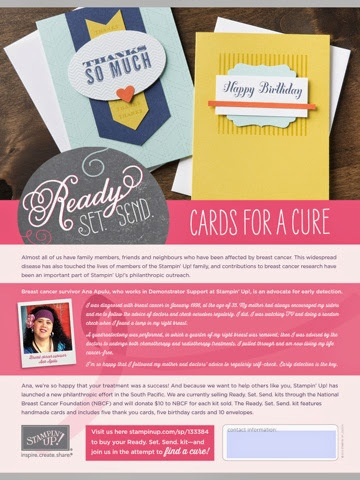 Your friends and family will love your handcrafted cards, and you can know that you are making as difference by donating to the National Breast Cancer Foundation.